I will admit that I am sometimes surprised to find good games at the console, even though I know that some are absolutely excellent. It’s not that good text-based games don’t exist, only that some are done so incredibly well that weaker titles become easy to overlook. curseofwar is a very good game, and is probably guilty of spoiling the field for quite a few other games. AI difficulty levels, randomization and controls for play balance. That’s tough to match, short of something grandiose like Dwarf Fortress. And if the help flags are to be trusted, curseofwar can’t be much more than a year old. As the human player, you are green, and your goal is to dominate the map. 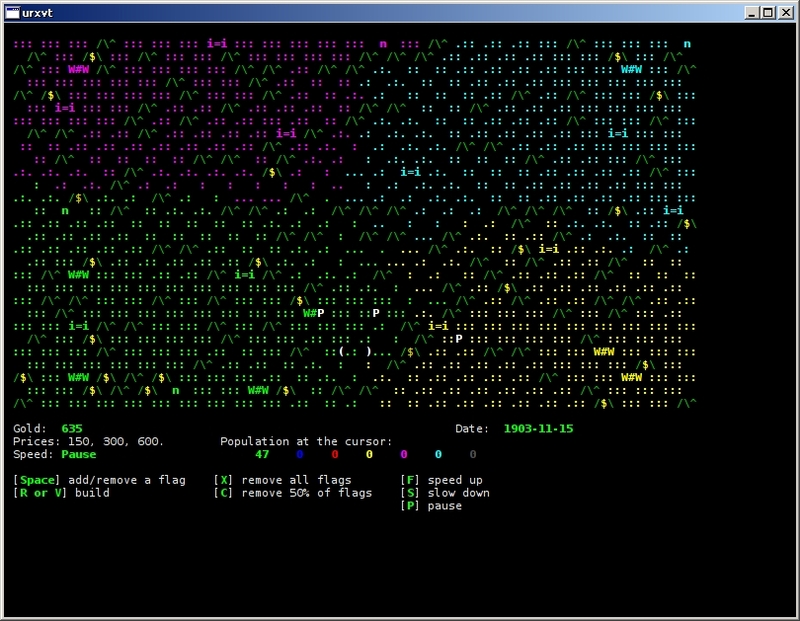 You don’t control units as much as population flow, which you can guide by setting flags with the spacebar. When set, your civilization migrates away from cities toward those points. Surrounding a gold mine adds to your treasury, and you can bolster your population by building villages, towns and fortresses. Each establishment improves your civilization’s growth rate, which in turn allows you to spread further across the map. I can find very few faults in the gameplay itself. The rules are straightforward and the computer AI seems persistent, but not foolhardy. It’s a little odd to watch population and finance rates advance at the rate suggested by the time line indicator, but I can suspend my disbelief. I have already found myself in a few four-way stalemate games though, probably because the populations find equilibriums and can’t work beyond those points. In fact, I think if you just leave a game running unattended against the worst AI, it will take a long time to trickle down to a winner … if there is one. I have a few complaints about layout; the command-line flags for map height and width don’t seem to take into account the size of the terminal. That means it’s tricky to get a map that takes advantage of unusual terminal dimensions — particularly if you pick rhomboid or hex-shaped maps. Even the default hex map at 114 columns wide spills across the screen and wraps around, making the game unplayable. Perhaps future versions could take into account COLS and LINES when judging map sizes, or offer a conversion between map tiles and screen columns. My only other suggestions would be to add some other RTS conventions — specific units, technology development, or economic fluctuation. I see no way to adjust the cost of villages, towns or fortresses, and it seems that a nation with its back against the wall would have a harder time paying for upgrades. And as more gold is collected, shouldn’t prices change too … ? Those are all minor complaints though, and it’s hardly worth mentioning some of them since they might not even fit what the authors had in mind. But like I said at the start, the bar is set higher for text-based games, because of incredible works like Dungeon Crawl or Cataclysm: Dark Days Ahead or Gearhead 2. Even classics like Empire or Sail set a standard that will take time and effort to match. But the youngsters are working toward that. In short, text-based gamers can afford to be picky. This entry was posted in Linux and tagged game on 2014/09/05 by K.Mandla.